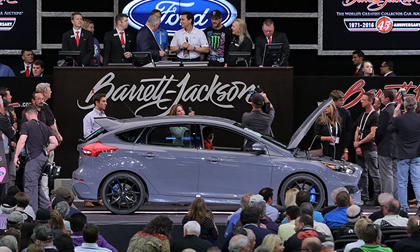 SCOTTSDALE, Ariz. – Feb. 2, 2016 – Barrett-Jackson, The World’s Greatest Collector Car Auctions®, was joined by Hollywood celebrities, pro athletes and top business executives to help raise $3,406,000 for local and national charitable organizations during the 45th Anniversary Auction from Jan. 23-31, 2016, at WestWorld of Scottsdale. The sale of these 11 charity vehicles brings Barrett-Jackson’s total raised to date to just over $88 million. Stars who used their celebrity to raise money for deserving charities included country music artists Zac Brown Band, Jay Leno, NASCAR driver Brad Keselowski and professional rally driver Ken Block. The Acura NSX VIN #001 supercar (Lot #3007) was not only this year’s top charity vehicle, but set a new charity record for an OEM VIN #001 at Barrett-Jackson with its $1.2 million sale. John Mendel, executive vice president of American Honda, was on the block to encourage bidders. Zac Brown Band performed at the Opening Night Gala earlier in the week to promote the sale of the car, and lead singer Zac Brown pre-recorded a special message reminding bidders that their donation would serve two worthy causes, the Pediatric Brain Tumor Foundation and Camp Southern Ground. Mark Fields, president and CEO of Ford Motor Company and professional rally driver Ken Block piloted a Ford Focus RS (Lot #3009) on the block in support of JDRF. As an incentive to bidders, Fields added one-on-one track time and driver training with professional drivers from the Miller Motorsports Park in Toole, Utah. General Motors was also a part of the spirit of charity with the donation of a 2016 Camaro SS VIN #001 (Lot #3008), which sold for $500,000 to benefit Kettering University and a 2016 COPO Camaro VIN #001 that sold for $300,000 and benefited United Way. Sixteen-time NHRA Funny Car champion John Force, as well as his daughter and NHRA superstar Courtney Force, were on the block for the sale of the COPO Camaro. Many other luminaries were also present to support causes close to their hearts. Tes Scanlon, Mrs. United Nations 2015, was on the block to support the sale of a 2015 JEEP Wrangler Custom (Lot #3001) to benefit Childhelp through SEMA Cares. Childhelp is the nation’s oldest and largest nonprofit advocating for abused and neglected children. Professional NASCAR driver and 2012 Sprint Cup Series champion Brad Keselowski was also in attendance to support the sale of his 2012 Dodge Charger NASCAR Racecar that benefited the Paralyzed Veterans of America. Additional $10,000 donated by Michelle Mauzy. Additional $10,000 donated by the Damon family.